Haven’t decided on a hotel yet? You can look at other available hotels in Brandenburg with Booking.com. Although the attractions and cultural excitement of Berlin draws the visitors, the state of Brandenburg, which completely encircles but is apart from the German federal capital, has lots to offer. Berliners looking for a quick weekend getaway come to Brandenburg to enjoy outdoor pursuits such as hiking, cycling, and fishing. After German reunification in 1990, the governments of Berlin and Brandenburg held a plebiscite to determine if the two states should merge under the name Berlin-Brandenburg. The measure was defeated with the Brandenburgers voting against and Berliners voting for unification by narrow margins on each side. Brandenburg’s history is 1000 years old. Quasi-independent, the electors of Brandenburg participated in the election of the Holy Roman Emperor. 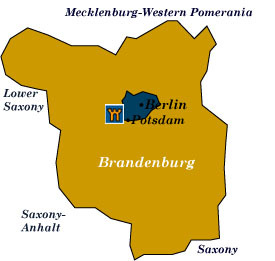 The golden age of Brandenburg began during the reign of Friederich-Wilhelm (1640-1688), who began the task of rebuilding the region after the devastation of the Thirty Years’ War. By the early 1700s, Friederich-Wilhelm’s son declared himself king of Prussia, which was to become an independent kingdom with the Hohenzollerns as rulers. Potsdam Unquestionably, Potsdam is Brandenburg’s most popular city, and an easy day trip from Berlin. Elector Friedrich-Wilhelm (1640-1688) declared it a royal city. His grandson, Friedrich II, built the splendid palaces in Sanssousi Park, now on the UNESCO World Heritage list. The park is immense and requires a map to negotiate one’s way around. Within the park, the Schloss Sanssousi, which means “without a care” is a glorious rococo palace. Lines are long and admittance is by guided tour only, so you must come early. The Neues Palace, which was the summer residence of the royal family, is the largest palace of the park with over 200 rooms. The Spreewald region lies to the southeast of Berlin and is filled with endless waterways and nature trails to explore. Punt boats on the canals are a popular activity. During the summer, cultural events are held in the town of Lübben. The area is also home to Germany’s only indigenous minority, the Sorbs. Despite attempts to Germanize them throughout the Middle Ages and again under the Nazis, the Sorbs survived, and their traditions are now celebrated in regional festivals.